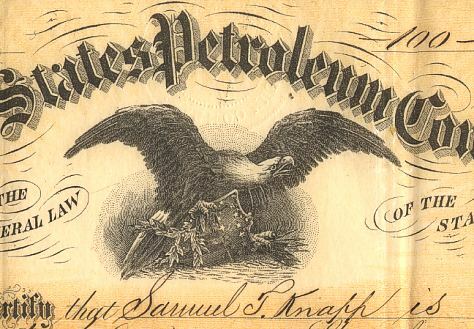 Beautiful certificate from the United States Petroleum Company issued in 1866. This historic document was printed by Geo. F. Nesbitt & Company and has an ornate border around it with a vignette of an eagle. 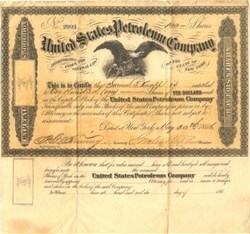 This item has the signatures of the Company's President, J. Nelson Tappan and Secretary, P.J. Fenning and is over 142 years old. The certificate was issued to Samuel T. Kapp. On 16 March 1864, James Faulkner leased part of the Thomas Holmden farm for $1.00 and one�fourth of the oil produced. The witnesses were Walter Holmden and Thomas Brown. Could this Thomas Brown be the Thomas H. Brown �diviner,� who with his witch hazel stick was soon to make history on the Holmden farm?1017 Shortly after these agreement with the Holmdens were made,1018 Faulkner, Frazier, Frederick W. Jones and J. Nelson Tappan formed the United States Petroleum Company. On Jan. 7, 1865 the Frazier well began to flow at 250 barrels a day. Stock in the U.S. Petroleum Company jumped from $6.25 to $40 a share.